Bathrooms are all over Instagram. Luxury bathrooms and bedrooms are all the rage online and we can never escape them. 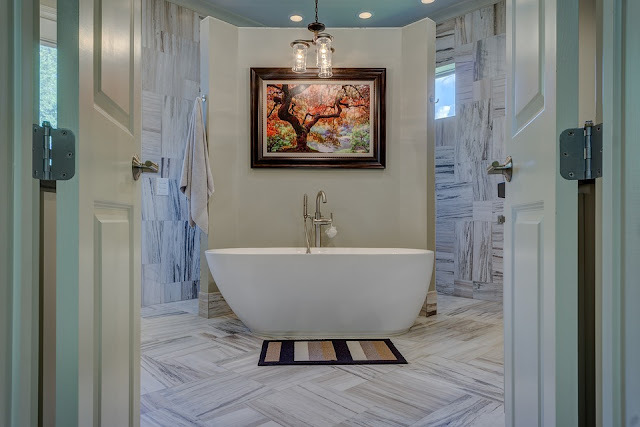 Gorgeous white porcelain and marble, stylish designer baths and Pinterest-worthy ideas but is this possible to achieve in your own home? When you get creative you can definitely style anything easily and efficiently it’s all about taking inspiration and putting your own spin on it. Especially if you have just moved in, you want everywhere to feel like home as quickly as possible! It’s not difficult to make your bathroom feel like part of your home easily, but with these few little tips, you can put your own spin on some old classics and give all your visitors a little treat when they step into your powder room! Of course it’s important to have modern facilities in your bathroom, for convenience, but if you have no room for separate showers and baths, then look at a shower bath. You can always make the room feel bigger and more spacious with mirrors or mirror tiles which are easy to find and easy to stick on the wall. Get a pretty shower curtain too, perhaps something that makes you feel happy, or stick to plain white if you want to keep it minimalistic and modern. Pick up a patterned curtain, it can break up the plainness of an all white bathroom. You can also use light coloured tiles which can reflect the light which gives the bathroom a luxury feel. Add plants and flowers to bring a little bit of nature into your bathroom and this makes you feel more relaxed and looks ultra pretty for your windowsill or vanity cabinet. Adding other little touches such as mood lighting near your bath, or under your window can be very relaxing when you’re having your long soaks. Why not also add some different sized candles to light when you are relaxing, they also can look lovely even when not lit and give a spa feel. Add white towels and wicker baskets for a more traditional feel, this looks chic too and this is a great way to display all your bath products or bath bombs to make everything easily accessible. Have soft rugs on the floor, to step out of the bath onto, and of course keep a nice soft dressing gown nearby to slip into as quickly as possible, as well as a soft pair of slippers, because there’s nothing nicer than feeling comfy and cosy after a relaxing bath. Keep a few little bits of make-up and perfume around for any guests to pick up and use if they’re there, you never know, they may be thankful for it! If you can, install a heated towel rail so in those winter months you don’t need to worry about grabbing a cold towel. For scents, there are many ways to keep your bathroom smelling absolutely gorgeous, either with reed diffusers, or scented candles, or even old fashioned pot pourri which gives off a lovely scent and it’s long-lasting also. Afterall, your bathroom needs to smell good when you walk in if you want it to feel lush and elegant!